Di sini, seperti dikutip dari Travel MailOnline fitur beberapa properti yang paling aneh dari seluruh dunia, termasuk sebuah rumah di atas batu 131 ft di Georgia dan batu-batu yang disusun seimbang pada singkapan kecil di sebuah sungai Serbia. 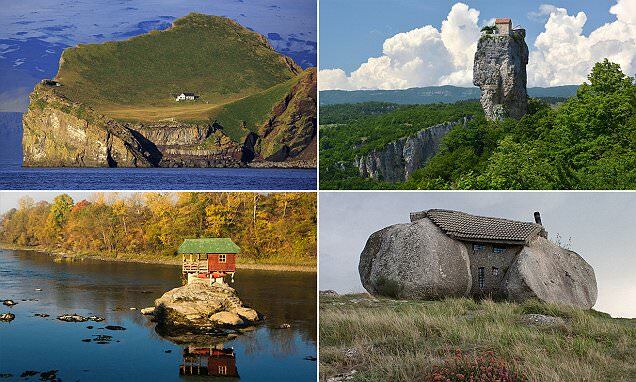 Gambar searah jarum jam dari kiri atas: Elidaey island di Iceland, Katskhi Pillar monastery in Chiatura, Georgia, Casa do Penedo in Portugal’s Fafe Mountains and a house in the middle of the Drina River in Serbia. They say a man’s house is his castle, but some homes are definitely an acquired taste. As humans have reached every corner of the globe, they have also fought tooth and nail to create a patch of land to call their own – occasionally in the most bizarre places. The following pictures show houses in locations that would take a sturdy backbone to sleep in. From the house perched perilously atop a towering rock in Georgia to the only building on an entire Icelandic island, some abodes look straight out of a Tolkien fantasy. Whether they hang over a cluster of rocks or are nestled amidst the treetops, these properties reveal how people’s tastes range far and wide when it comes to where they like to lay their head. Capturing the imagination of holidaymakers keen to witness man-made wonders, Mail Online Travel has rounded up some of the strangest houses around the world.